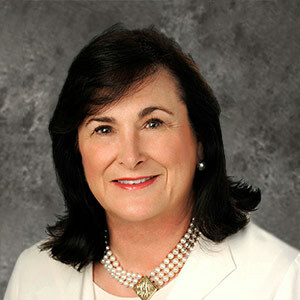 Jamie Ison is a native of New Albany, MS and a received her undergraduate and Master’s degree from the University of MS. She moved to Mobile in 1977 and served as Director of Mobile Preschool for the Deaf and Alabama Institute for Deaf and Blind from 1977 until 2002. In 2002, Jamie was elected to the Alabama House of Representatives where she served for 12 years. She was Co-Chair of the Mobile Delegation and Chairman of the State Government Committee. Jamie is a member and Past-President of Rotary Club of Mobile, Sunrise. She is a graduate of Leadership Mobile and Leadership Alabama. Currently, Jamie is a Realtor with LLB&B Real Estate and serves as the Federal Political Coordinator for Congressman Bradley Byrne. Jamie has been married to Jay Ison for 32 years. They have two sons, Philip and Wyatt. Jamie is a member of St. Paul’s Episcopal Church.